Did you realize this? Every day we inhale more air than we drink water! But what exactly are we inhaling? These days there’s a lot of talk on PM2.5, the carcinogenic fine dust in the air, and the public is starting to pay far greater attention to air pollution. But not only is outdoor air quality poor, indoor air quality may harm our health just as much or even more as a result of new paint, upholstery, furniture, poor ventilation, and kitchen fumes. 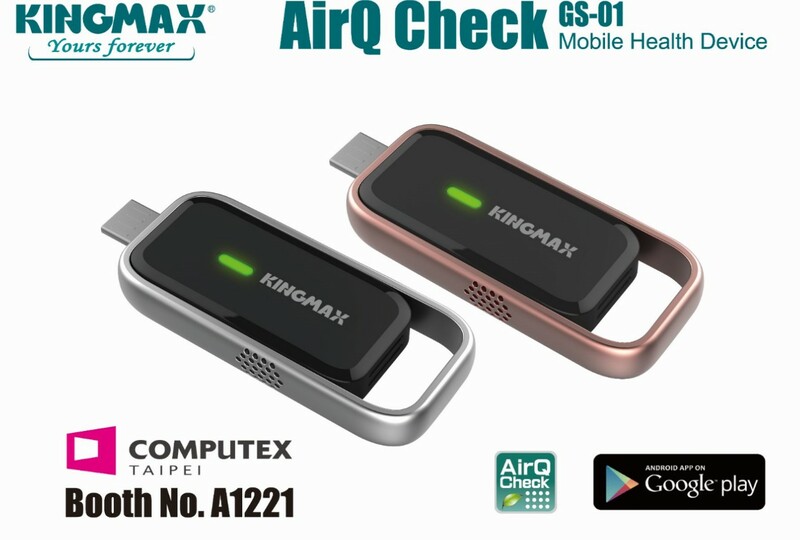 As our noses cannot detect many of the harmful substances in the air around us, KINGMAX is now launching the AirQ Check Air Quality Monitoring Mobile Device. This easy-to-use portable device allows users to the check air quality around them anytime anywhere. Knowledge is power, and this knowledge gives them the power to protect the health of their loved ones and themselves. Concerned with the increasing severity of air pollution, the KINGMAX team has spent several years to research and develop a device to monitor air quality. This has resulted in the lightweight portable AirQ Check Air Quality Monitoring Mobile Device. When inserted to a smartphone, it connects to an app and instantly detects TVOC and CO2 concentrations and tells whether they exceed health limits. The AirQ Check will display three types of feedback: a green light for good air quality, yellow for ordinary, and red for hazardous. Thus the user knows when they are in a poor air quality surrounding. The AirQ Check also detects UV values, humidity, and temperature to give the user a full picture of the air they’re breathing. The elegantly styled AirQ Check comes in silver-grey and rose gold. The lightweight metal frame and understated matte coating make for a sophisticated device that harmoniously matches with many smartphones. The AirQ Check is a fashion statement and a health device rolled into one. Slimmer than conventional flash drives, the sleek casing features an ergonomically designed push-slide cover for optimum protection and convenient storage without the worry of ever losing the cover. The AirQ Check also provides an intuitive user interface. The device does not rub on a battery. Instead, connecting the the AirQ Check to a smartphone through a common MicroUSB, it will take in just the little power it needs and switch on the app and detection function. Now, this is truly Plug and Play. Children, adults or seniors can now easily monitor the indoor and outdoor air quality around them anywhere, anytime to protect their loved ones and themselves. Now that you know about the smart and stylish KINGMAX air quality monitoring mobile device, what are you waiting for?